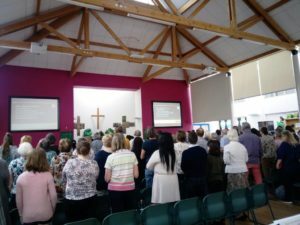 The congregation pray for Mary. The Starburst attendees worshipping together. 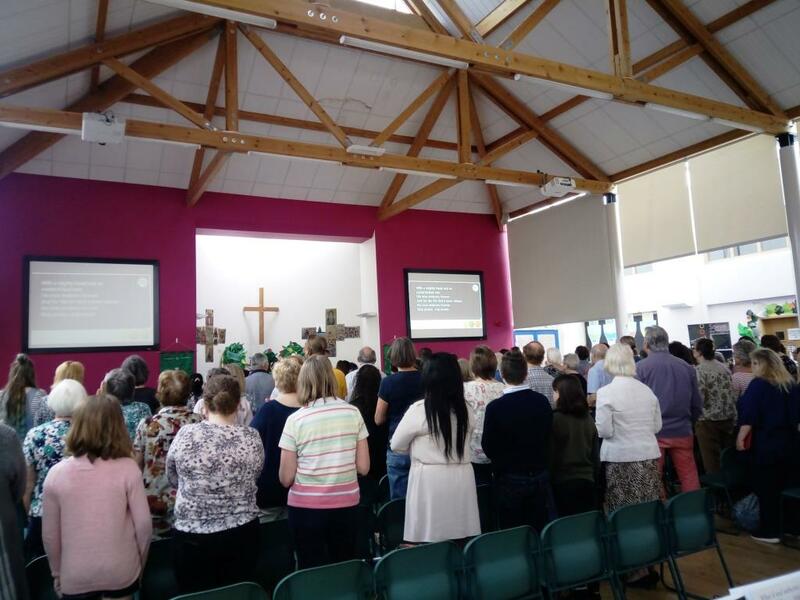 Starburst 2018 – the Diocesan Children’s Ministry Conference – took place on Saturday (16th June), with over 90 people attending. 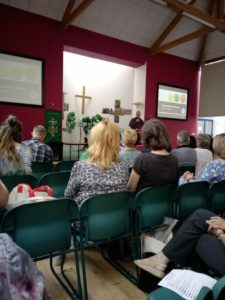 The event began with an introductory talk from Bishop Donald on Luke 14:25–34, which can be heard here. 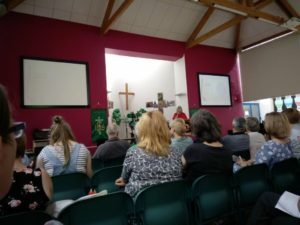 The call of Jesus to discipleship expressed in the passage was described by Bishop Donald as “how we can become child-like in the right ways”. 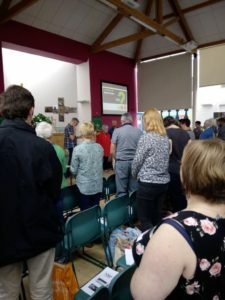 Bishop Donald stated that Jesus “wants to call us to an intimacy of discipleship” and compared it to how a little child gives its total focus and attention when talking to a parent or another adult. “A child needs all of you. Jesus wants the same – all of you … He wants your total devotion – that’s what it means to be child-like”. Bishop Donald also stated that children are good at asking for help, and that adults can learn from their example. Half of the churches in England have fewer than five under 16s. 55% of those who leave the Christian faith do so between the ages of 11 and 24. Mary said that the young people who leave the church “are not rejecting God – they’re rejecting a place to express/explore their spiritual yearning”. Research from Dr Rebecca Nye (author and lecturer in child psychology) also showed that “spirituality is innate in each child”. The evidence was clear – making the church a place where children can feel included and equal is vitally important. They also need the right space in which to worship, and to be led well – it doesn’t have to be hip or trendy! To hear Mary’s inspiring talk in full, please click here. After the workshops, there was a Q&A with Mary Hawes, and an introduction to the Diocesan Certificate in Children’s Ministry. The event finished with a sensory worship activity – led by Chad Chadwick – and a closing rendition of ‘It Is Well With My Soul’. It was a fitting end to an inspiring day.